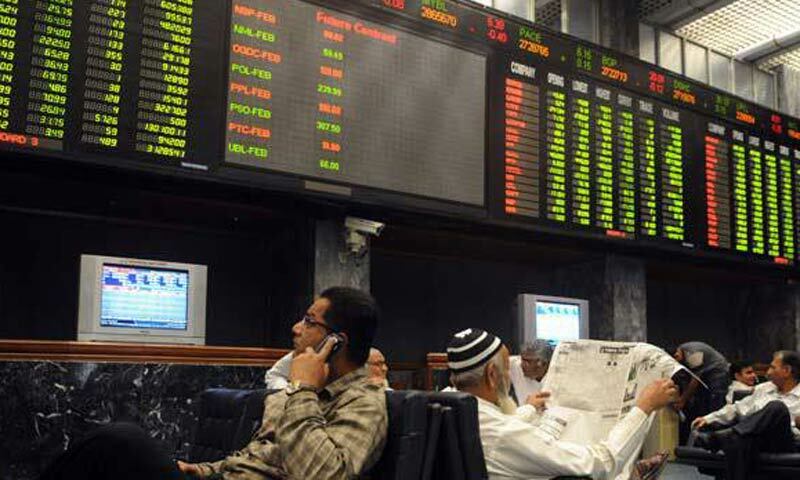 KARACHI: The raging bulls crashed through the psychological barrier of 27,000 points on Monday, adding a huge 284.03 or 1.06pc to close at new all-time high at 27,176.26. Analysts forecasting profit taking after the heavy gains last week were taken aback by strong rally on Monday, powered in great measure by the heavy-weight oil and gas sector, where POL gained 2pc, PPL was up 4pc and OGDC firmed up by 1.2pc. The sector also saw APL up by 1.97pc and NRL mopping maximum gain of 5pc. However, the most spectacular performance was seen in PSO which again hit its �upper lock� on Monday. The Oil Marketing Company stock has now seen an incredible rally appreciating nearly 20pc in just five trading sessions. The PSO stock is now trading at its 52 week high. Although third tier stock TRG led the volume with 19m shares, the overall trading value surged to Rs12.4bn on Monday from Rs9.6bn last Friday. The leading buyers on Monday were mutual funds which invested net $6.20m. Contrary to the day-long talk of foreign buying, the figures released by the National Clearing Company showed that the overseas investors had offloaded $2.33m worth stocks on Monday. Local participants were enthused by a measure of stability on the security front with seriousness seemed to be seeping into talks with the militants. The surprising strength of the Rupee against the dollar also boosted investor sentiments. Investors were also encouraged by the fact that Pakistan weightage in the MSCI frontier market index was set to increase to 6.8% from 4.3% from May onwards as Qatar and UAE graduate to emerging market status. Analysts also pointed out that the investors were also taking cue from the Mumbai stock Exchange which also shot to its fresh historic highs. Analyst Ahsan Mehanti stated that institutional interest was noted in selected cement, telecom and banking stocks.